The 2010 Census counted 50.5 million Hispanics in the United States, making up 16.3% of the total population. The nation’s Latino population, which was 35.3 million in 2000, grew 43% over the decade. The Hispanic population also accounted for most of the nation’s growth—56%—from 2000 to 2010. Among children ages 17 and younger, there were 17.1 million Latinos, or 23.1% of this age group, according to an analysis by the Pew Hispanic Center, a project of the Pew Research Center. The number of Latino children grew 39% over the decade. In 2000, there were 12.3 million Hispanic children, who were 17.1% of the population under age 18. There were 33.3 million Hispanics ages 18 and older in 2010, a 45% increase from 2000. 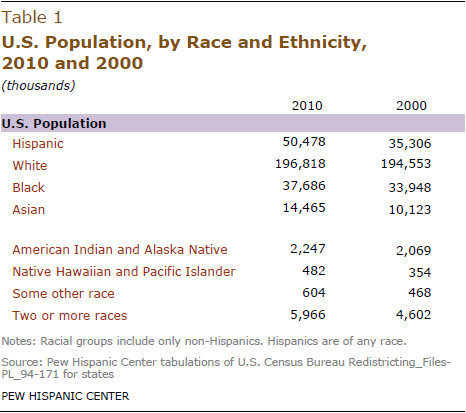 Hispanics made up 14.2% of the adult population in 2010, compared with 11% and 23 million people in 2000. Racial and ethnic minorities accounted for 91.7% of the nation’s growth over the decade; non-Hispanic whites accounted for the remaining 8.3%. Hispanics, who can be of any race, are the nation’s largest minority group. Looking at the major groups of single-race non-Hispanics in 2010, 196.8 million (63.7%) were white; 37.7 million (12.2%) were black; and 14.5 million (4.7%) were Asian. There were 6 million non-Hispanics, or 1.9% of the U.S. population, who checked more than one race. By race, more than half of Hispanics—53%, or 26.7 million people—identified themselves as white alone, an increase from 2000 when 47.9% did. The next largest group, 36.7% or 18.5 million Hispanics, identified themselves as “some other race,” a decline from 2000, when 42.2% did. An additional 6%, compared with 6.3% in 2000, checked multiple races. Although the numerical growth of the Hispanic population since 2000—more than 15 million—surpassed the totals for the previous two decades, the growth rate of 43% was somewhat slower than previous decades. Growth rates topped 50% in the 1980s (53%) and 1990s (58%). The count of the nation’s Hispanic population was slightly larger than expected. The 2010 Census count of Hispanics was 955,000 people and 1.9% larger than the Census Bureau’s latest population estimate for Hispanics. In some states, especially with small Hispanic populations, the gap was wider. Geographically, most Hispanics still live in nine states that have large, long-standing Latino communities—Arizona, California, Colorado, Florida, Illinois, New Mexico, New Jersey, New York and Texas—but the share living in other states has been growing. In 2010, 76% of Latinos lived in these nine states, compared with 81% in 2000 and 86% in 1990. (In 2000, 50% of Hispanics lived in California and Texas alone. In 2010, that share was 46.5 %.) Despite the pattern of dispersion, however, there are more Latinos living in Los Angeles County (4.7 million) than in any state except California and Texas. As the accompanying charts show, the states with the largest Hispanic populations include eight with more than a million Hispanics, the largest of which is California, where 14 million Latinos were counted. The dozen states where Hispanics are the largest share of the population include five where Latinos are more than one-in-four state residents—New Mexico, Texas, California, Arizona and Nevada. The states with the largest percent growth in their Hispanic populations include nine where the Latino population more than doubled, including a swath in the southeast United States—Alabama, Arkansas, Kentucky, Mississippi, North Carolina, Tennessee and South Carolina. The Hispanic population also more than doubled in Maryland and South Dakota. 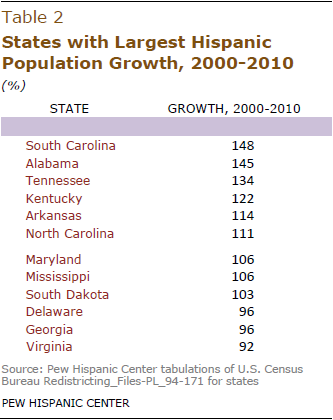 In six states, growth in the Hispanic population accounted for all of those states’ population growth; if the Hispanic population had not grown, those states would not have grown. They included Illinois, Louisiana, Massachusetts, New Jersey, New York and Rhode Island. In Michigan, the state population declined over the decade but the Hispanic population grew. Looking at the Latino population by region, the West and South are home to the most Hispanics, while growth has been most rapid in the South and Midwest. In 2010, 20.6 million Hispanics lived in the West, 18.2 million lived in the South, 7 million lived in the Northeast and 4.7 million lived in the Midwest. Paul Taylor provided editorial guidance in the drafting of this report. Daniel Dockterman prepared the charts and tables and checked the text; Gabriel Velasco checked its charts and tables. Michael Keegan prepared the website graphics for this report. Molly Rohal was the copy editor for this report.